This is an online collaborative tool designed with the partner Facts & Files, which allows students to transcribe and annotate documents related to the First World War, like diaries, letters, etc. The possibilities offered by this tool are numerous, as you can choose from a large variety of handwritten texts and primary sources and use these documents in the context of any subject of your choice. This could be, for example, in History (related to WW1 and national/regional history), specific language classes, or in Civic, Social and Political Education programmes. Transcribathon can be used in a wide variety of educational settings (from secondary to university level) and it allows students to work either in groups or individually. Besides, the tool is available in various languages, which helps students to engage even more fully with their heritage or to use it for language learning. This is a very fun and powerful tool that can bring history to life, and that will help you engage students with history they don’t find in the textbooks. Berlin Transcribathon 2017 interviews (music) from Europeana on Vimeo. If you want to give it a try, you can use this tool directly in your classroom or even set up a Transcribathon in your class or school ‘in competition’ with other schools. If you are interested in organising such an event with Europeana or with your Ministry of Education, you can get in touch here. Besides, you can also have a look at this video for more information. 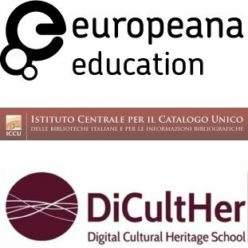 The event will be organised by ICCU and hosted by the Biblioteca Nazionale Centrale di Roma, in cooperation with Europeana and Facts & Files as part of the Europeana 1914-1918 Centenary Tour. Participants, history students from Roma Tre University and pupils (14-16 year old) from two high schools, will start the event on Monday 8 October with a finale and award session on Friday 12 October, during the “digital innovation week” organized by the ICCU.